The month of July was supposed to be 31 days of membership posts. But I planned poorly. My wife had a surgery in July, we had a week vacation on the beach in July and I relaunched this site and migrated it to a new hosting platform (Rainmaker) in July. So it might come as no surprise that I only reviewed 21 plugins in 31 days instead of the full 31. Never fear, I will continue in August, to finish up, but it will be more like every couple days that I write – so that my readers not associated with membership plugins don’t stay away for so long. If you’ve missed the series so far, here are the plugins I’ve looked at already. And the best ones are seriously, no joke, still to come! There is a lot to like about Magic Members. If you visit that link, you’ll find a ton of features. When counting the features there were on par with S2Member or DAP, but different in nature. Instead of giving you low level options that only a serious WordPress or membership person would know, these are features you’d understand, in terms of configuring. Magic Members, like DAP and S2Member, went for the ‘tons of features’ approach. But make no mistake, this isn’t a fast plugin to get configured – because it too has tons of set up screens to navigate. Four features are worth highlighting as we dig into Magic Members, beyond content protection. I get a lot of folks that call me on Clarity and ask me about building a simple pay per view or pay per post site. They want to sell reports, for example, and not force people to become members just for access to the page for that particular report. But they want it in the context of a larger potential offering of a membership site. With Magic Members, pay per post and pay per view (limiting the number of times a person can view that page) is fast and easy. These guys are serious about letting you connect any way you want to. That puts Magic Members on par with Digital Access Pass, and just below Cart66 and WooCommerce with Memberships. Don’t believe me? Check out the dedicated page (with notes) they have for payment gateways. Most membership plugins don’t support integration with forums. A few do – and I’ve been detailing it when they do. My upcoming reviews will have more that do. But most of the time it’s support for bbPress. But what if you’re not using bbPress? What if you want to use something else? For those that have been using SimpleForums, Magic Members integrates with it. More and more membership plugins are supporting delayed delivery of protected pages or posts (dripping content), but Magic Members has been doing it for a while, and has extensive support for it. So if you’re worried about having members sign in and download all your content at once, you don’t need to worry with Magic Members. Support for MailChimp – check! Support for InfusionSoft – check! Support for multiple memberships – check! Support for downloads – check! Support for coupons – check! Support for different “home” pages per membership – check! Support for RSS feed protection – check! 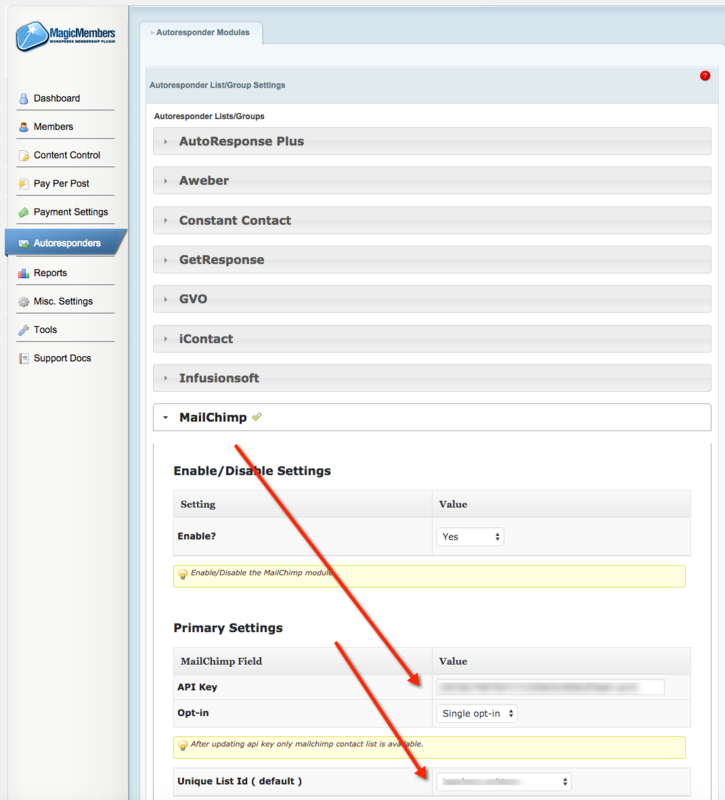 Support for custom fields at registration – check! Support for reminder emails before expiration – check! As you can see – that’s a lot of feature support for your membership site. Want to see more of their plugin and experience the backend on your own? You can skip past setting it up and configuring it, and go straight to their demo page. So now let me tell you the part of the story that isn’t feature-related. Because you might be in the same spot that I was. This is what you want to see. And in retrospect, this is probably one of the first pages you should look at, when installing Magic Members, to make sure everything is working right. I’m going to tell you the story of not looking here first. It starts three weeks ago – on a Saturday when I was going to install, take screenshots, and write a post about Magic Members. And by way of background, I used this plugin a couple years ago, so I thought this would be a fast setup. I knew what I was doing. Or so I thought. I host sites at Pagely and WP Engine and do most of my membership plugin testing on a WP Engine site. Their revert feature that lets me wipe a site clean and start again (going back to a saved backup) is a really great feature that helps me do these reviews on a server other than my local workstation (allowing me to work from anywhere with any computer). So I installed the plugin on WP Engine Saturday morning and started to configure it. One of the early steps I took was to integrate it with MailChimp. What’s supposed to happen is that you put in your API key and then click “save”. That makes a call to MailChimp servers to validate your account and pull back a list of your lists. That way you can pick the list you want members placed into. It didn’t matter how many times I clicked save, that second field – with the lists – wouldn’t populate. Ok, so something on WP Engine is blocking my use of this plugin. I get it. Let me go to Pagely. When I get to Pagely, I install the plugin and go to activate it, and I’m told I don’t have another valid license. I hate the way many WordPress plugins do licensing. I get licensing. I get that you pay for support, if the plugin is GPL, but that, to me, should mean I can still install and activate the plugin without support, if I don’t have another url-based license to use. In this case, that was not to be. So I thought – no problem, I’ll deactivate it from the old WP Engine site and use it on the new Pagely site. Well, apparently that’s not a real-time system, so that meant I couldn’t re-use it. So I purchased a second, unlimited license. In hour two or three of this non-setup. I then tried to activate it and it told me I couldn’t. I had run out of licenses. How do you run out of an unlimited license? Seriously? But then I figured it out – I needed to install a different version of the plugin, the new download, because I was still using the old one. My tip to developers who build plugins with different levels of licensing – don’t create multiple versions of your plugin. It’s a pain! So with the new plugin installed and activated, I went back to the autoresponder (this time first before doing anything else) and tried it. And it broke there too. Without any error message at all. I have a technical background. Most people know me as a guy who blogs or stands on stage talking. Others know I manage software developers in my day job. But none of those roles suggest I should use anything other than a WordPress managed host. And I like using managed hosts because I don’t like becoming or acting as a system administrator. But I wanted to get this plugin working and my hypothesis was that something in the managed environments was limited me – from features or from error messages. So I went to DigitalOcean. You know, hosting for developers where I get to do everything on the command line. I spun up a new install, called a droplet. And I named it wrong. So I had to go back and rename it – so that I could point a url to it, so I could activate the plugin with a fully qualified domain name. I picked an Ubuntu distribution and asked for WordPress to be installed – which worked fine. But it’s not like you’re done yet. Once I got WordPress working, I went to install the plugin. But it was too big to upload. The server told me to change settings in one of the php config files. But I just went straight to sFTP to upload the file. Somewhere in that process I had to change passwords – which took longer than it should have so I’ve blocked it from my memory. And when all that was done, I activated the plugin. And I headed to the autoresponder section to see if I could make it work. I had to wait three weeks to tell you this story without any foul language. And that’s when I got the error message and told me I needed a different version of a Curl library, which I got to install via the command line for fun. And after four hours all I had was an empty, yet activated, Magic Members plugin that could connect to MailChimp. Here is my score, and it’s a good one. Just be warned the learning curve is seriously steep.